The portrait of Isabella Hammad, writer, was shot on the 10th of November 2016, at the Santa Maddalena Foundation (Donnini, Reggello, Florence, Italy), where she was a guest. 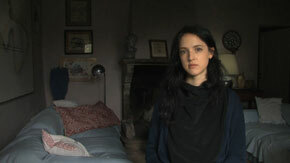 It is part of a series of ‘silent’ film Portraits, shot in real time from 2005 to date. I ask people of different ages and professions, to pose for about ten minutes without speaking or acting. At the end I film their observations if any.